We’ve all had the symptons. Ear aches from the constant racket. Throbbing head from the repetitive chatter. Constant longing for something new. Something different. Something soul. BEHOLD! For I have a cure to your need for a vivacous, talented, genuine-spirited singer/songwriter. This Queen hails from the southernmost part of Florida (Miami to be exact). Her name is so aptly appropriate. Meet Rimidi! 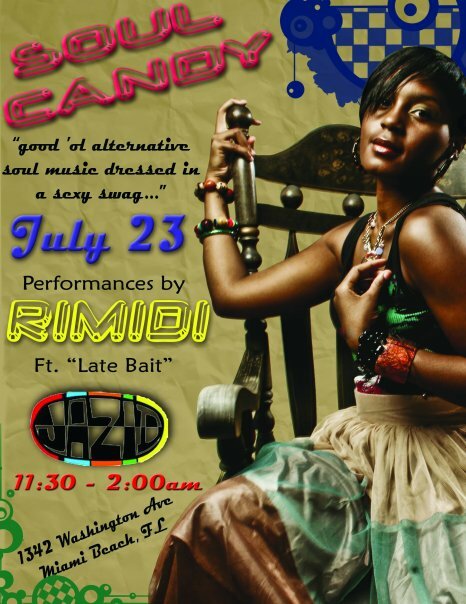 On July 23rd, Rimidi will be performing alongside her band “Live Bait” LIVE at SOUL CANDY hosted by Jazid in Miami, Florida! This is a F-R-E-E event and Rimidi + Live Bait will be gracing the stage for an hour-long session filled with Rimidi originals and popular cover songs from some of your favorite sangas! Jazid is located at 1342 Washington Ave. in Miami, Florida. Doors open at 10 p.m. Feed your appetite for good soul music. View flyer for more details and check out other news, photos and video performances of Rimidi at www.RimidiMusic.com. Tell her I sent you!